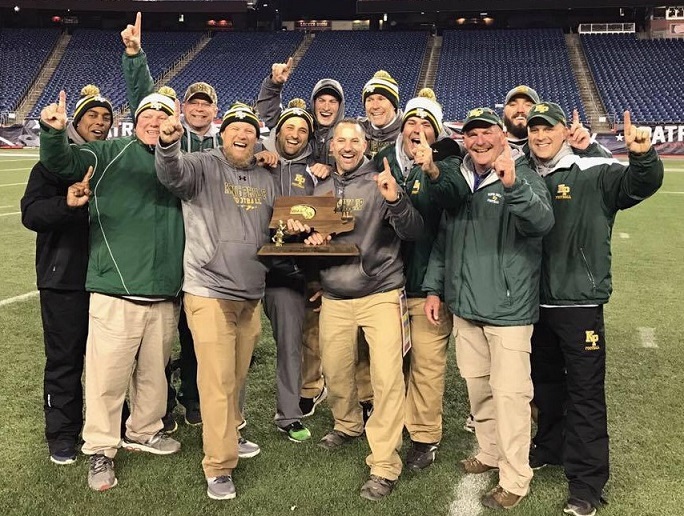 Head Coach Brian Lee has made huge strides in rebuilding the KP program since his first year in 2005 to back to back State Championships in 2016 & 2017. The Hockomock now knows what KP Pride is all about! After playing high school ball for Walpole, winning the 1989 Superbowl, Brian went on to play at Bridgewater State. Because of injuries, he hung up his cleats after one season and turned to coaching. Walpole, Curry College, and now KP have been the fortunate recipients of his energy and coaching ability. Brian teaches PE at KP, lives in Norfolk with his wife Colleen and two kids, JT and Payton. He enjoys music and fishing when he's not living and breathing football. 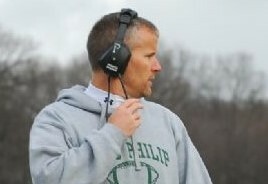 Matt has been with KP as the Defensive Coordinator since 2006. Under Coach Wassel, KP has led the Hock in points allowed per game eight out of the last ten years. After playing high school football at Walpole (with Coach Lee) and winning the Div. 1 1989 Superbowl, Matt attended WPI. At WPI, he played free safety, was a captain and a two-time All-Conference player. Immediately after graduating in 1995, Matt coached defensive backs at Stonehill College for three years. Before coming to KP, Matt gained coaching experience at the following high schools: Braintree, Wellesley and Oliver Ames. For the past 17 years, Matt worked as a Fitness & Health Teacher at Wellesley High School. He currently resides in Walpole with his wife Rachel, daughter Sofia, and son Chase. John has over 20 years coaching experience at the college and high school levels. He is currently in his third stint at KP as offensive coordinator. 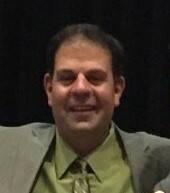 John was previously the head coach at Norwood High School. John enjoys spending time with his family and traveling. He resides in Foxboro with his wife Alisyn and daughter Marie. Greg has been coaching football at KP since the 2009 season after coaching 6 years at the youth level. Growing up in Stratford, CT, Coach Norris was a 2-sport HS captain for football and track. He attended UConn where he earned a B.S. in Marketing, and is currently a Senior Sales Pro for BSN Sports. Coach Norris lives in Wrentham with his wife Deb. In his spare time he enjoys traveling. With Jay's coaching credentials, it's not surprising he has found a home with the KP Warriors; 1988 - 1989: Norwood HS Defensive Coordinator, 1990 - 1991: Walpole HS Defensive Line Coach, 1992 - 2000: Norwood HS Line Coach, 2001 - 2007: Dedham HS Head Football Coach, 2008 - 2009: Norwood HS Line Coach. Jay graduated from Springfield College and works as a Wellness Teacher at Dedham HS. He enjoys spending time with his family and traveling. Chris is entering his 5th season as a Varsity Coach with Coach Lee, having run the Freshman Defense for 7 years. While attending Walpole HS, he played in 2 Superbowls under the watchful eye of then Offensive Line Coach, Brian Lee. Chris went on to play college ball for Springfield College and UMass Boston. Chris is a realtor at Chris Perchard Homes Real Estate Group in Franklin. Chris lives in Wrentham with his wife Corinne, son Jacson and daughter Kynslie. Matt is a KP Football Alum 2006 - 2009, a stater all four years and senior capitain. He made the Hockomock All-Star Team OMVP 2008 season,and was part of the team that turned it around for KP from 2 - 9 his junior year to 9 - 2 senior year. Matt has a degree in Exercise Science from Bridgewater State University and owns MTM Home Servies, a demo & drywall business. He lives in Wrentham and likes to fish. After spending 14 years as Walpole's Freshman Head Coach, Coach Gough moved to the KP program where he has had many impressive seasons. Coach Gough grew up in Algonac, Michigan and stayed in his home state to attend Central Michigan University where he earned a teaching degree. Since his time in Michigan, over the past 25 years, he has been teaching 5th grade in the Walpole School District. Coach Gough and his family, wife Bridget and son Matt, live in Wrentham. Mike is entering his 9th season with the Freshman program. 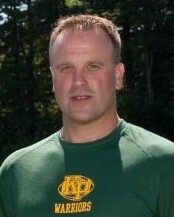 Mike attended KP from 1986-1990 where he played baseball, hockey and football. He is a graduate from the University of Massachusetts at Amherst and Merrimack College. Along with coaching football, Mike also coaches baseball and basketball for his boys Camden and David. When he is not coaching youth sports, he coaches families as a Financial Advisor with 1776 Financial in Franklin. He lives in Wrentham with his wife Tricia, who is a Special Education Teacher in Franklin. Matt is a 2010 KP Grad playing O-Line and D-Line for the Warriors and was a part of the track team. He graduated UMASS Amherst in 2014 studying Psychology and Classics. 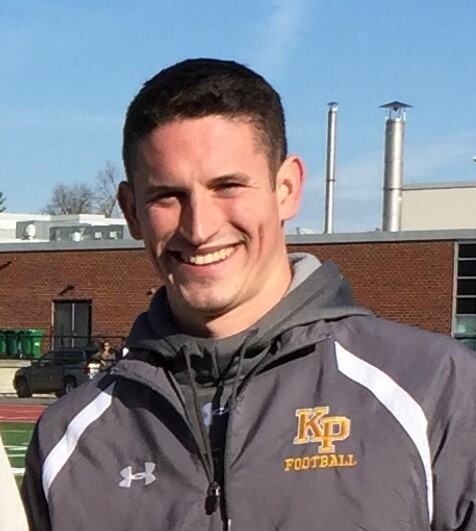 He is now working at KP as a teaching assistant while coaching football and track. Micah is a 1990 KP Graduate, playing football from 1986 - 1990. He has been an independent financial representative from 2009 - 2017 and married to Irene Thompson for 12 years. They live in Wrentham with their 2 daughters Taylor, 14, and Mikayla, 10 years old.